Sure, the label on your Côtes du Rhinoceros suggests that the grapes were tended by craggy, distant-eyed, French-accented wine savants who nurture the earth, as did their fathers and their fathers' fathers before them. But the truth is, if modern technology can make for better vino and cut costs, plenty of winemakers are going to buy it. (Anyway, between hotter summers and an influx of bulk wine from around the world, that French guy will soon be out of a job.) Here's how they keep the Tempranillo flowing. This drone images vineyards in near-infrared, which shows distressed vegetation in need of attention. Grapes travel past a scanner that compares them to a platonic ideal for shape and color. Then it blasts any duds into the ejection chute with puffs of air, Willy Wonka-style. Sensors beam weather data to a central database. Software then suggests when farmers might, say, switch on the sprinklers to avert vine damage from a freak frost. With a 3-D object recognition system and shears at the end of one arm, this Pixar-inspired bot prunes vines as it rolls down each row. This spectrometer reads sugar, acidity, and flavonoid content to pinpoint the optimal moment for harvesting. Older machine harvesters mangled as many berries as they left intact. 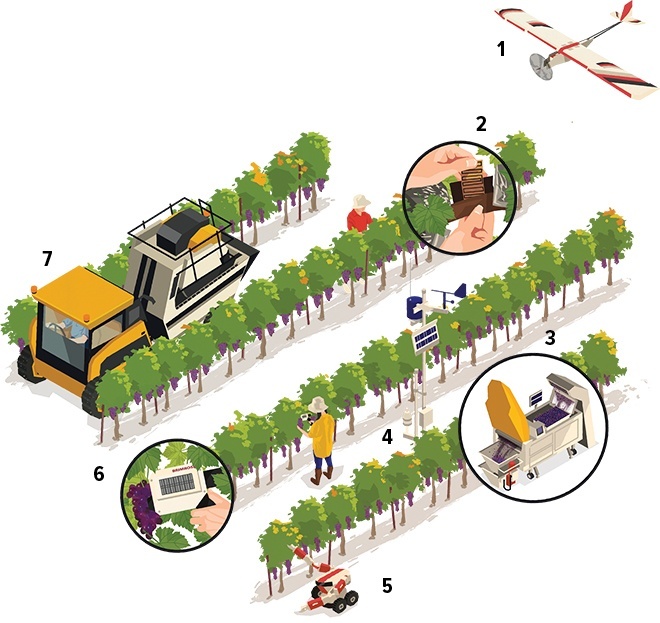 The Pellenc pinches vines with rods that vibrate at the exact frequency to make ripe berries pop off, fall onto a conveyor belt, and roll into a collecting bin.